Your NRCS Conservation Plans will now contain a “percent residue after planting” under the tillage section. If it doesn’t, please ask to see the RUSLE2 printout for your rotation. 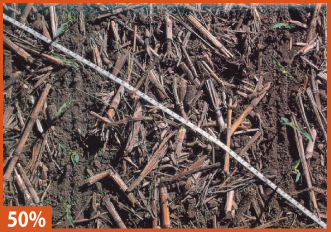 You need to be aware of how much residue is left on the soil surface after you plant because that is what is checked for compliance spot-checks. 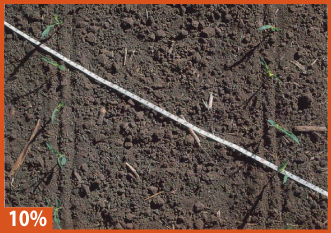 The easiest way to estimate surface residue is to use a 50′ or 100′ measuring tape. Stretch the line diagonally across the rows (at a 45 degree angle). Count the number of marks (each foot) that have residue under them when sighting from directly above one side of the mark. It is important to use the same point on each mark for accuracy. 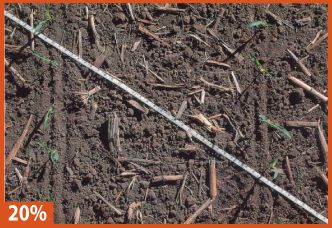 Don’t count residue smaller than 1/8 inch in diameter. Walk the entire length of the tape (or rope). 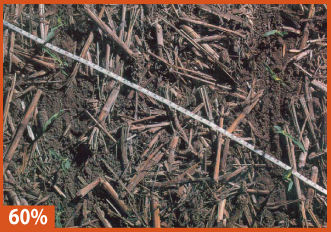 The total number of marks with residue under them is the percent cover for the field. If your rope or tape has only 50 marks, multiply by 2; for 25 marks, multiply by 4. Repeat the procedure at least 3 times in different areas of the field and average the findings. 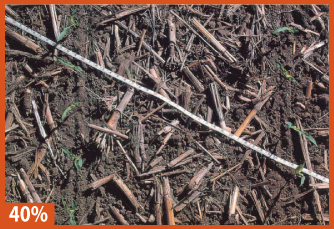 For more information Below are some photos from NRCS to help you visualize what the different residue amounts look like. 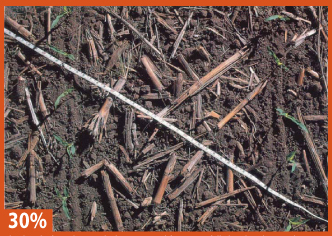 More information about residue amounts can be found by clicking on this pdf, Farming with Crop Residues.